I found a set of Cherry K.E.F CRESTA 3 by chance. Left + Right + Centre speakers. Somebody literally dump the speakers at a void deck. I discovered the woofer rubber surround edge had peeled. I resealed them with E-6000 Craft Glue. I proceed to purchase the BELDEN 814 Studios cables. Remove the CRESTA bridge plate. Bi-wire to the Amplifier. My first Amplifier for the CRESTA was the DENON AVR-1910. The sound was not too bad but there wasn't much charisma to talk about. The Bass was mild. The Mids was loose. Treble was good. All in all there was no punch in music listening. I kept wanting to turn up the volume hoping for more dynamism which was silly. 9 months later I had enough of the DENON AVR protection mode kept coming on for no reason. Threw it away. The magic happens on 26 November 2018 when I had the CRESTA paired with a vintage PIONEER SX 300 amplifier. To keep things short. If you have the K.E.F CRESTAs don't underestimate their capabilities. Pair them with a quality amplifier. The bass can react with multiple buoyancy. Music listening becomes tight and precise. No more muddy crappy sound from new-age integrated amps. One last advice: Remember to TOE-IN the speakers. They sound remarkable when you do that. No weakness. I only believe in what you pay is what you get. Each has their own preference in the speakers they love. Very nice sound, for any kind of music. Bass, midrange & trable are balance. The sound could be "bigger". I bought these a couple of years ago for a bargain price of £110. It was meant to be a temporary solution and I was going to replace them with a pair of 'proper' hi-fi speakers in due course. However, I've been fairly happy with them so I'm going to keep these and skip the £500 price category upgrade. The sound is quite neutral which means that Crestas are at their best when playing acoustic music such as small combo jazz or the likes of James Taylor and Joni Mitchell in their acoustic mode. The bass is not the mightiest I've heard but modern dance / r'n'b / hip hop sounds fairly convincing and there is no trace of 'boominess' you might expect. That said, the bass can be a tad weak when playing indie/alternative type guitar-based music or metal - these are neutral-sounding speakers. I have these in a large room and I feel they'd be more at home in a more confined space. For best results, use a powerful amp and 'toe-in'. Lastly, I must say that I wasn't particularly happy with the sound quality when I first brought them home but I think that was more down to the quality of my cd player and amp at the time. After upgrading these component and in time I've grown to like them a lot. sloppy bass until you get it under control. Move them away from the wall. Go to the hardware store and for $2.36ea get 2" rubber test plugs and stick them in the bass ports and screw them down tight. At First, I thought these speakers kind of sucked. There was uncontrolled bass everywhere. Once I sealed the bass ports they completely changed and so did my opinion of them. Very nice sound. Good depth and imaging. They can now show the weaknesses in my amp. Appearance - the veneer is hideous!!! 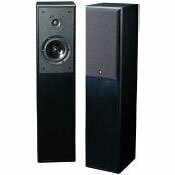 Lack of Bass - these roll off big time well before 45Hertz in my opinion - keep em near a wall. I purchased these after my lovely old Celestion bookshelf speakers shat themselves....... They served me well but they were sounding REALLY ''loose'' after twenty years of solid service. I find the KEF''s a little harsh compared to my old beauties but I''m learnign to love them. They sound pretty good with Jazz, old school blues and R&B but classical is where they really shine. (Do NOT expect these to play loud rock n'' roll or dance! )A bit boxy in the cello department but that''s a given in this price range...... Overall I think these are pretty good value for money.